SQL Server BCP and Phantom CRLFs – IT & Digital. 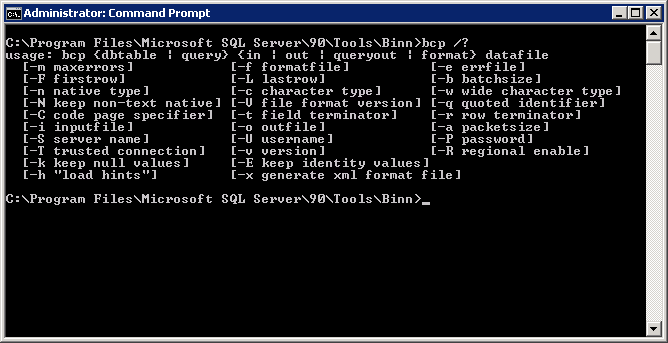 Microsoft SQL Server comes with bcp.exe, a command-line tool that uses the Bulk Copy Program API. It allows to export data from tables and queries, import data from files into tables and it generates format files. As the final output should be an XML file, we need to tweak the T-SQL query with XML statements and append FOR XML PATH('Customer'), ROOT('Database'), ELEMENTS to format the data accordingly. Now we’ll construct the command line and save it in a batch file bcp.bat. In order to create the XML file, the parameters queryout, -x (XML output) and -w (wide character also known as ntext) are important. Give it a try, execute the batch file. Now, if the query ran successfully, open the XML file with Internet Explorer and you’ll get… an error! Than to import data from file to Table?